When Google announced the Nexus 7 at Google I/O on June 27, they were quite mum about the release date, stating only that it was available for preorder that day and would be shipping in 3-4 weeks, mid-July. At the time, Google mentioned it would only be available through its Play Store online and not through stores; especially since selling through stores may require a higher price point since stores would need some margin. However, as time went on, news broke out about stores such as Staples and Gamestop receiving stock of the coveted tablet. The news reinforced that the tablet would be available soon and customers who preordered looked forward to a charged credit card and an e-mail from Google saying their tablet has shipped. Things began to slip when, earlier this week Wednesday, stores began selling their stock of Nexus 7 tablets without a peep out of Google regarding preorders. People who preordered felt betrayed although Google quickly put a stop to the early selling of tablets. However, stores were back to selling the tablet on Thursday and purchasers flocked to forums saying where other Android fans can purchase a Nexus 7. Those who preordered at this point were frustrated. Some reported that their credit card was charged already. Others, who preordered on Day 1 did not have anything to report. Google’s silence did not help matters. 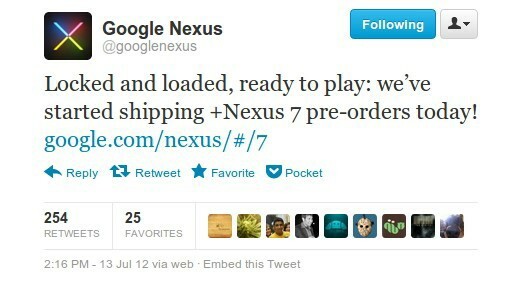 Luckily, Google, in the spirit of Dr. Suess, tweeted early Friday morning that Nexus 7 preorders were shipping out. Finally, customers knew their tablets were on their way by the next week, but they were a bit angry that they could buy a tablet and have it quicker by going to a Gamestop. Google had broken the definition of “preorder” most people subscribed to. In the realm of books, video games, and iPhones, people have come to expect that preorders will ship and be delivered on release day, allowing people who preordered avoid long lines and still have their new toy on Day 0. And there lies the loop hole. Google never gave a release date. Technically, they’ve lived up to their promise of shipping preorders by mid-July. However, Google’s customers expect more of them. Keep in mind, Google is mostly a search engine company with a strong presence in the cloud and has had no need for shipping and operations logistics. Google appears to want to change this and become a direct seller of products to end users through its Play Store. Recall Google was unsuccessful at this in 2010 with its Nexus One. Part of its failure was the low adoption of Android, needing to work with cellular carriers, and low awareness due to a lack of marketing (again, because they’re a search engine company) – only die hard Android fans knew about the Nexus One. Since then, Google has begun to push its direct business again – first with the Galaxy Nexus earlier this year and now with the Nexus 7. If Google wants to be successful in this, it will need to devote some resources to operations, logistics, and marketing. The Nexus One was a brilliant phone, but a failure because it didn’t make its way to the hands of end users. The same is true with the Nexus 7. It’s an amazing tablet, but if people aren’t aware of it, they won’t buy it – instead looking at Apple’s iPad instead. This is an awareness issue that marketing can address. Operations and logistics will help solve the gaffe with the Nexus 7 launch. Google needs to hire an expert in transportation logistics to ensure preorders are in the mailbox on release day. Operations will work with stores to prevent the early selling of products. In addition to all of this, Google needs to become more transparent with their release dates. The Nexus 7 is not the first product that had no specific release date at announcement. The Galaxy Nexus was another product and fans in the US who were eager to pick one up waited week after week, living off of the latest rumors as to its release. Sure, Verizon is also responsible for part of the blame, but I strongly believe operations and going as far as having a carrier liaison would have resulted in a smoother release. Hopefully Google has learned a lesson from the Galaxy Nexus launch in the US and the launch of its Nexus 7. Fans love Google’s products, but Google needs to step up its game in distribution. I have no doubt that Google can and will make changes in the future and am looking forward to receiving my Nexus 7 in the mail some time next week. To the people who preordered and are upset that others have it ahead of you, it might be a good idea to exercise some patience. What’s a few days? Google, please continue to refine your operations. I hope your next product launch (next Nexus phone?) will be smooth, transparent, specific, and on time. Feel free to lay down the gauntlet against the cellular carriers as well. I want to see more Nexus phones and devices on Verizon (sorry, shameful and selfish request)! ← Video Game Console Life: 10 Years Too Long? Whilst I am keen to get mine as soon as possible, I don’t believe google have trodden on my expectations at all. Like you say, no release date was promised and when I ordered it I did feel like it was a gamble… some you win some you lose. I don’t feel let down, but I do still want my new tablet to arrive asap! !